Ruth sees a way of using the women's friendship to her advantage and is given the go-ahead from her lawyer to turn informer on selected criminals. Anne tries to help Daphne, who sinks further into depression and hurts herself. Lexie is removed from the mugshot credits, Myra and Lou shift up one and Nora is tagged on the end. After seeing her cocky attitude in the rec room, Lexie and Nora suspect Lou of framing Myra: Nora says she saw Lou and Kath in the corridor outside Myra's cells. Alice tells Lou she'll support her if she's going for top dog. Lexie sees the state of Ruth's cell and offers to help her clean it up. When Ruth offers her a lipstick as a gift, Lexie is suspicious, so suggests Ruth should cut cards with Lexie for it. Ruth takes the cards from her and shuffles them herself, then draws the higher card. Willie weeps over a soap on TV (see below). May tells Lou she won't back her as top dog as she knows she set Myra up. Julie explains to Lexie that she beat her at cards by memorising the cards played and working out what was left in the deck. She then amazes Lexie with her detailed recall of Arnold Ballinger's profits. Lou offers to help Ruth if someone is planning to stage an escape and gets a smack across the face when she pushes it too far by being familiar about her husband. May and Willie find their cell wrecked when they return from their morning shower. Ruth employs Daphne to clean her cell, and then tries to bribe Dennis to help her out occasionally. Ann arrives in reception to find it piled high with boxes of stuff for Ruth. Joan returns to work. May is annoyed at having her wool unravelled and bashes Lou to make her tidy it up. Ann lets Joan know she isn't pleased to see her back and warns her not to bend the rules for her own benefit. Nora feels faint in the laundry. Andrew Fry refuses Ann's suggestion that Joan should be transferred to Barnhurst. Ruth demands a private phone in her cell: Ann turns her down. 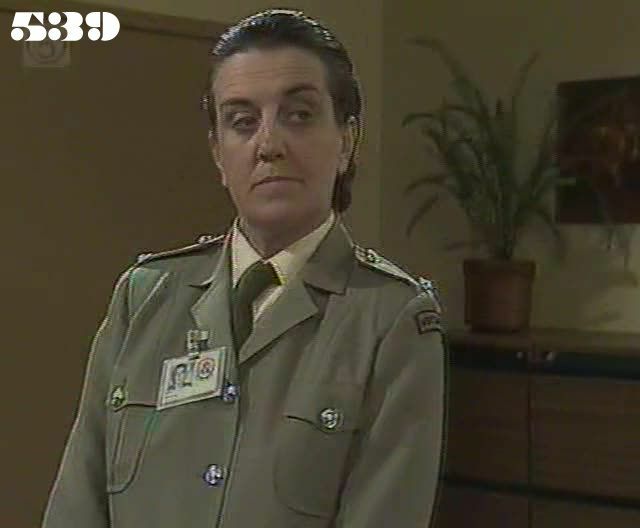 Joan takes a tour round the building and introduces herself to the new prisoners in the laundry. While the women are distracted, Daphne sneaks over to the press and burns her hand. Ann tells Daphne she won't punish her but she must see a psychiatrist. The women get a postcard from Ettie. A newspaper headline about Ballinger claims he has "dumped" his wife . Daphne is allowed to work in the garden every day, as Ann suspects that she may be affected by being cooped up all day. Joan catches Lexie in Ruth's cell: Ruth covers for her by claiming she had already given permission to Lexie to help herself to nail polish, and casually hands a bottle to Joan saying it is "her colour" - it is bright green. Nora leaves the dining room early, but Joan won't let her take food out for later. Meg visits the retirement village and Ettie tells her about the changes at Wentworth since she left. Ruth puts a brave face on her husband's apparent desertion when she sees Willie ostentatiously reading the paper right in front of her. Sadie thinks Ettie is silly for not telling Meg she is having second thoughts about life on the outside. May forces Julie to overcome her fears by taking out the laundry truck on her own, but Dennis startles her when she runs into him in a corridor. Joyce tells Meg she's left Norm, and asks Meg if she can stay at her place overnight. Ruth sees George Costello, a lawyer sent by her husband: he tells her Arnold wants her to stay in Wentworth and pass on minor information to the police to keep them happy. Sadie is appalled by Ettie's latest scheme: she has decided to commit a crime to get back in Wentworth. The backgrounder called Jill in the last episode is called "Brodie" at mail call. Meg tells Ettie they have had nine (not eight) prisoners from Barnhurst. I never thought I'd see you again Marsha, I thought my whole world had collapsed around me.